This is an article from our archives that was previously run on another site in December, 2008. Meandering a bit north of the Catalan town of Figueres you get close and closer to La Jonquera at the French border. Just before hitting it, you veer sharply to the right and go further up in to the foothills of the Pyrenees to get to the village of Cantallops. The name for English speakers might sound like, “cantaloupes”, but it’s anything but. If you take it at face value, in Catalan it means, “singing at wolves”. But it appears if you dig a bit deeper that the name has an old Latin root to it that means something more along the line of “wolves’ rock” which makes much more sense given that the town is built on a massive rock outcropping and they had a big problem with wolves up until the 19th century. This is a quaint, mountain town that seems small at first, but is actually surprisingly large given how remote it is. There are a great number of restaurants in the place that aren’t catering to the cheap French who stumble and grumble across the French/Spanish border for cheaper alcohol. No, this is a place that sees normal folks who go there specifically for the purpose of enjoying what the small town has to offer. But probably the best thing about this small hamlet is that they have two excellent wineries. One is Masia Serra. It’s a nice place, but not often open, which makes it hard to judge the wines as getting a tasting is tricky short of picking them up in the local store where they are readily available. The other winery is Vinyes dels Aspres. Now, this is a winery that we actually first encountered back in 2007 at a Spanish wine show in San Francisco. I can’t say enough good things about this winery. For starters, the owner, David Molas Albertí is a very enthusiastic guy. He’s restarted his family’s winery after decades of their not producing wine. With the exception of picking the grape harvest, he does everything himself. He bottles, ages, and sells about 40,000 bottles of wine a year. As if that’s not enough, he works another job and is really just doing this winemaking part time at the moment. I have no idea how he finds all the energy. But with all this exuberance, he is producing some incredibly top quality wines. This is the only one of two wineries I’ve ever found a White Garnatxa (the other being neighbor, Masia Serra). 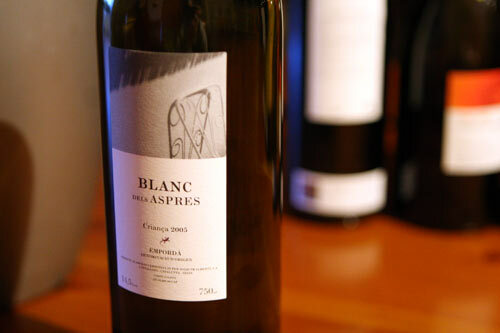 The red version is everywhere in Catalonia, but no one seems to want to make a white wine of it. This is a serious error as in white form it is simply unlike any white that I’ve ever tasted before. Minerally yes, but with a strong, succulent body and light sweetness to it, that makes it great for both white and red drinkers alike. At €12, it’s more expensive than the vast majority of wines in the area, but oh, oh so worth it and quite affordable when you compare it to US prices. The other standouts were the S’Alou, which is a high-end red made primarily of Garnatxa. It’s a hearty, complex red. There is a lot of strawberry in the nose once it opens up properly. The oak in the body is subtle without really being overpowering, yet at the same time strong enough to be appreciated. Again, at €23, it’s getting rather pricey for the region, but is a wine that is very much worth every euro. But the #1 wine that David is producing is the Bac de les Ginesteres. It’s a sweet wine make from the raisin grapes late in the harvest. If left to age normally, these Garnatxa raisins would produce a sweet wine just like the lower cost Negre de Panses. But, to punch it up another notch, David places the wine in large, clear glass bottles that he then ages in the sun of all things. Again, at €30, it’s a decently high-priced sweet wine, but it is transcendent. I have gotten a new appreciation of dessert wines in successive trips to Spain, but this wine, this creation is so above and beyond and Moscatell and Garnatxa sweets that I’ve had before. The wine is nutty in the glass and like the best sweet Sherries that I’ve ever had. All I can say is wow. Of course with only 500 bottles a year being produced, it is not easy to come by. If the wines didn’t speak enough for the winery, David is doing other things to make it stand out. He also sources all of his grapes from his own lands. He doesn’t buy any grapes from outside growers, which is nearly unheard of due to it limiting your production amounts with land plots being rather small. And of the grapes the he grows, Garnatxa is predominant. 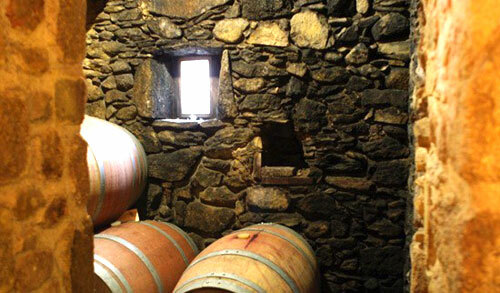 Every wine that he produces has Garnatxa in it. He does this because it is a local varietal (yeah, I know, it’s Grenache up in France, but it really is a Spanish Catalan grape) and he feels a good deal of pride in growing it. He doesn’t grow anything like Cabernet Sauvignon or Chardonnay because they aren’t local. David wants to be a Catalan winemaker first and foremost and in this he is doing exceeding well.